The Goose that “Makes” a Golden Egg? Breakfast, the most important meal of the day. That’s what they say anyway. I guess I’ve just never beed a fan of eggs, pancakes or oatmeal. Bacon is of course, a whole other story, which we will cover some other day. My family however, is hugely excited by breakfast of any kind, especially eggs. I scramble them, hard boil them, sunny side up, down, and poached. You think they’d be bored by now? Let’s have a little fun with our eggs, shall we? 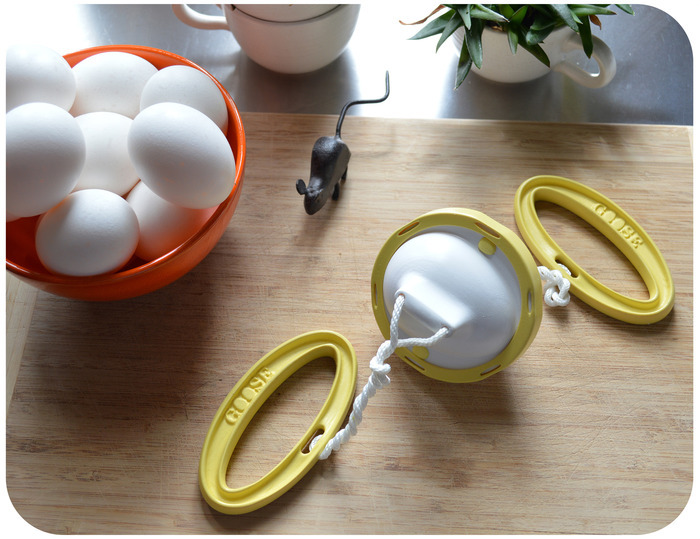 Check out the Goose, a nifty little kitchen novelty, comprised of two flexible nylon cords that attach to a plastic case. You simply put your boring old egg inside the enclosure and then, after winding the strings, you pull them apart like you would like one of those old winding/unwinding toys, spinning the egg forwards and backwards. This force breaks apart the yolk and allows it to mix with the egg white, effectively scrambling the egg inside its shell. Now, you hard boil it, and when peeled, you have a lovely, hard-boiled, golden egg, with none of that tasteless white part, and, no dry yolk center. Much better. A hard boiled golden egg, makes for quite a lovely presentation, is tasty, highly portable and … okay, it’s just fun. The Goose is currently part of a Kickstarter campaign, and certainly is the easiest and fastest way to make a golden egg. Sure, you can find varying degrees of success using t-shirts and nylon stockings, but for around 28 bucks you can get a ‘yellow’ Goose, an illustrated instruction manual, and a recipe guide. Oh go ahead, your kids will think it’s magical. The idea is great! But come on, Julie: to say that “Goose is currently part of a Kickstarter campaign” in a June 9 posting when funding closed May 15 is absurd! Do you actually know what you post??? My apologies! I have participated in several Kickstarter campaigns, and often once funding closes there is no way to order until they are successful at production. I now see the link to their website for pre-orders. My mistake.